Dozens of fun, hands-on projects and activities from frontier days. Join twelve-year-old Tom, his eleven-year-old sister, Amy, and their little brother, Tad, in Wyoming Territory in 1878. 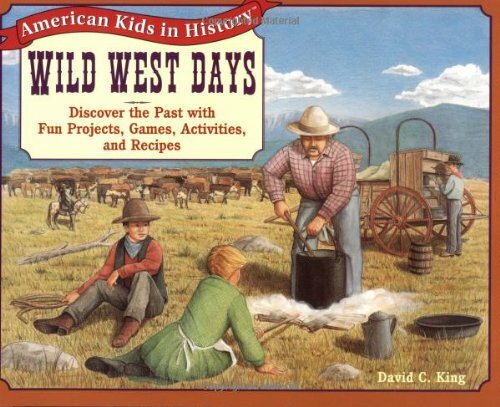 Share the fun, adventure, and hard work of daily life in the Wild West. You'll discover exciting games, make toys and crafts, and perform everyday activities just like Tom, Amy, and Tad. Make your own ranch-style scrambled eggs and cook up a batch of delicious sourdough flapjacks. Paint an Acoma bowl, build a model pueblo, make a pioneer cap to wear, or weave a basket from a few simple materials. You can twist together a lariat to wear as a belt, or practice knot tying--that is, if you have time after the mustang-and-cowboys board game or the party pi?ata project. Wild West Days is filled with interesting historical information and fun facts about growing up in days gone by. Discover how different--and how similar--life was for American kids in history. Watch for Civil War Days, the next exciting book in the American Kids in History series! Also available: Pioneer Days and Colonial Days.